*Configurations for Theatr Bryn Terfel are flexible, please see website for the configuration for your chosen performance. Pontio volunteers and members of the public choose show for upcoming circus festival! Migrations, a not-for-profit community interest company based in north Wales brings international contemporary arts to Wales while developing innovative collaborations, commissions and partnerships in Wales and further afield. It recently initiated The Community Choice, a project aimed at making members of the public understand the processes behind artistic decisions. In April 2018, Migrations partnered with Pontio and worked with a group of Pontio’s volunteers and members of the public to curate an event for Pontio. Migrations guided them through the process of considering several potential performances, discussing their artistic qualities, potential to engage with Pontio’s audiences and new ones, and possible best contexts to present them among other things. They have selected Pelat by Spanish artist Joan Català, to be presented as part of Pontio’s forthcoming Circus Feast which takes place between 18-27 July 2019. Look out for show times for Pelat in the Circus Feast programme which will be published in late May. We believe that the Arts should be inclusive therefore encourage volunteers from all backgrounds to join us - the only requirements are to be aged over 16, enthusiastic, friendly and reliable. It’s hard to believe that it’s been almost a year since we welcomed the Globe to Theatr Bryn Terfel for the first time. and I’m delighted to say that they will be returning this season with three plays, Twelfth Night following its success last year, Comedy of Errors and the lesser-known Pericles – with plenty of workshops and talks, food and drink with a Shakespearian flavour to enjoy! We’ll be bringing the arts and sciences together for the SYNTHESIS project in an accessible and fun way for everyone to experience, and the Street Voices play under the BLAS youth participation project will offer a platform to those voices which need to be heard. Our biennial CIRCUS FEAST will this year celebrate ‘the world at our feet’ – with a production by Ethiopian company Circus Abyssinia and a new production by local circus company Cimera – Drudwen, telling a familiar tale on the one hand and totally unfamiliar and astounding circus techniques on the other within the same week. There will be the usual range of comedy, concerts, gigs and ballet – and a Family Fun Day in the company of Dafydd Iwan, National Children’s Poet of Wales Casia Wiliam and artist Luned Rhys Parry... including some soothing Baby Brahms in the morning! Don’t forget either about our film showings and the live screenings of opera and plays at our cinema...Pontio is waiting for you...come join us! Dumbo, Wild Rose, ROH Live, At Etern The White Crow, ity’s Gate, Girl, Life of Brian a llawer mwy! and much more! Glyndebourne Cinema Season Filled with emotions, Glyndebourne returns to cinemas with three productions from its 2019 Festival - painted in bold musical colours, magic is sprinkled through a season that also gathers together some classic operatic fairy tales. Sunday 14 July 5.30pm Mischief and mayhem run riot in Rossini’s most popular comedy. Figaro, the renowned Barber of Seville, has a cunning that knows no bounds. His playful energy is brought to life in director Annabel Arden’s sparkling and springing production. This is also another chance to catch Danielle de Niese who plays the determined Rosina. Cinderella (Cendrillon) (Live) Sunday 30 June 5.30pm A brand new production directed by critically-acclaimed actor and director Fiona Shaw (Harry Potter, Killing Eve), the classic Cinderella story is told with composer Massenet’s sensuous and lavish score. Glyndebourne favourite and international star Danielle de Niese plays the titular role in this glittering and colourful opera. The Magic Flute (Die Zauberflöte) (Live) Sunday 4 August 5.30pm Mozart’s most magical comedy of The Magic Flute returns to Glyndebourne for the first time in over a decade. This new production by the renowned directing/design duo Barbe & Douce promises to take a fresh and playful look at the opera’s troublesome gender politics. Leading British bass Brindley Sherratt stars as Sarastro alongside exciting young singers including Caroline Wettergreen, Sofia Fomina and Björn Bürger. Summer Showcase £5 £4 students and under 18s BU Dance are putting on their final showcase of the academic year and this time, it’s going to be bigger and better than ever. As a club, they have smashed all of their previous records and have been working their socks off to stay on top all year. You’ll get to see their awardwinning dances, amongst the widest range of styles they’ve ever taught and put on stage. They’ve been training in professional workshops throughout the year; really ramping up their game. Please come along and support them, this will be their greatest show yet... don’t miss out! Three choirs combine to perform one of the world’s great musical masterpieces. The St Matthew Passion relates the Easter story in a sequence of glorious music, by turns dramatic, reflective, thought-provoking, and imposing. First performed in Leipzig on Good Friday 1727, it is widely regarded as one of Bach’s greatest works, and the most operatic of oratorios. In-Visible Light £5 In-Visible Light is a research and development project to develop a brand new family vertical dance performance. Building on a previous collaboration between photonics scientist Ray Davies and Kate Lawrence for Pontio’s Synthesis commission in 2016, this project asks some big questions such as: How can you hear light? How do you measure the moon? Can you hear sounds in space? The ambition is to create an immersive sensory experience of some natural light phenomena such as the ‘Big Bang’ (actually silent), the aurora and bioluminesce. Collaborating with composer Guto Puw and object designer Femke van Gent, the audience will be invited to experience sound, light and motion through all the senses. No audio description for this experimental performance will be provided in order to find out how much visual information can be conveyed through other sensory modes. A 20-minute performance will be followed by a discussion and optional ‘have a go’ vertical dance workshop. This research performance is suitable for all ages and we warmly encourage discussion and feedback afterwards. Limited capacity – please book early to avoid disappointment. We are developing an educational booklet and will have a sample of this for feedback at the showing. Friars, led by BLAS, Pontio’s arts participation programme for young people. 10 students were given an introduction to the work of St Mary’s Hostel by the Hostel’s Manager, Hayley Owen, before visiting St Mary’s and getting to know some of the community of the hostel over a period of five weeks. The conversations were recorded and then developed into a verbatim play by the young people under the guidance of playwright and theatre practitioner Branwen Davies. This special evening will be hosted by the presenter Gwion Hallam, who has been a part of the Lleisiau / Voices project from the very start. The evening will include interviews with the young people who have taken part in the project, as the journey of this project is as important as the final production. A bilingual event with simultaneous translation available for the panel discussion. £15 £12 students & under 18s A special evening of song and chat to celebrate 20 years of professional singing. Rhys Meirion will be sharing the stage with some of the artists and friends that have played a role in his journey so far. As we reach the end of another university year, North Wales’ largest community of musicians comes together for its annual celebration of the very best of university music-making. Join us for an incredibly varied and uplifting concert, with music to suit all tastes! Soundtrack Disco ÂŁ1 Come and join us for the popular FILM+ soundtrack disco in the Studio over half term. With family films to enjoy, come to dance and get rid of some energy before or after the film. Dressing up as your favourite film character is very much encouraged! See our monthly cinema programme or the website for details of which film will be shown on this date. A resource for teaching, research, public education and enjoyment. Treborth Botanic Garden comprises planted borders, species-rich natural grassland, ponds, arboretum, Chinese garden, ancient woodland, and a rocky shoreline habitat. Six glasshouses provide specialised environments for tropical, temperate, orchid and carnivorous plant collections. We organise regular talks, plant sales, specialistÂ workshops, crafts and more! Romeo a Juliet £13 £11 concessions 10% discount for groups of 10 or more From forth the fatal loins of these two foes A pair of star-crossed lovers take their life Following the success of their last visit, Critics’ Circle Award winning company, Ballet Cymru, present their extraordinary adaptation of Shakespeare’s masterpiece “Romeo and Juliet” once again at Pontio. Intense fighting, passionate duets and universal themes echo through dramatic and lyrical choreography. Exquisite costumes and extraordinary video projections create a world of danger and excitement where two young lovers are caught in an age old feud. Romeo a Juliet is a dynamic and unique collaboration between 3 of Wales’ outstanding arts organisations, Ballet Cymru, Coreo Cymru and The Riverfront in Newport. Y Brain/ Kargalar £10 £8 students and under 18s Directed by Memet Ali Alabora Performed by Pınar Öğün, Rebecca Smith-Williams After years of repression and censorship writer Meltem Arikan moved to Wales where she feels a deep sense of belonging. In a state of personal crisis, her Turkish-speaking, repressed, rigid self, Mel, meets her Welsh-speaking, adventurous, nature-loving self, Tem, for the first time. Toby Hay Toby Hay is a guitarist and composer from near Rhayader in mid Wales. Inspired by history, people and landscape, Toby writes beautifully evocative guitar instrumentals that effortlessly transport the listener to the mountains and rivers of his homeland. Twice nominated for the Welsh Music Prize, Toby has toured the UK and Ireland extensively over the last few years and has built a reputation as a captivating live performer. Georgia Ruth Georgia Ruth is a musician from Aberystwyth in West Wales. Her debut album Week of Pines won the Welsh Music Prize in 2013 and was nominated for two BBC Radio 2 Folk Awards. She released her second album; Fossil Scale in 2016. Demonstrating a departure in sound, it was praised by The Independent for its ‘wealth of sonic detail’. A skilful harpist and pianist, Georgia was a guest vocalist on the Manic Street Preacher’s Futurology album and has toured India extensively as part of the Welsh/Ghazal Indian group Ghazalaw. Gareth Bonello Gareth Bonello is a Cardiff based songwriter performing under the stage name The Gentle Good. His album Ruins/ Adfeilion won the Welsh Music Prize in 2017 and he was awarded the Welsh Language Album of the Year at the National Eisteddfod in 2014 for Y Bardd Anfarwol. Gareth writes in both Welsh and English and is drawn to the innate musicality of both tongues. An accomplished live performer, Gareth has enchanted audiences all over world and has worked extensively with artists in China and Northeast India, and opened Pontio’s first ever China-Wales Festival in February 2018. Take That: Greatest Hits Live Take That and get ready to party at Pontio Cinema as Gary, Mark and Howard bring their huge 2019 Greatest Hits tour LIVE to the big screen on Saturday 8 June, for one night only! Celebrating 30 incredible years, this highly anticipated anniversary show promises to be their best yet. Family Fun Day To celebrate World Oceans Day, we’ll be opening the doors on a whole lot of fun suitable for the family. From Cwm-Rhyd-y-Rhosyn singalong sessions with Dafydd Iwan to poetry with the National Childrens’ Poet of Wales Casia Wiliam, Minecraft to movies, and tasty treat making and stories to crafting workshops and samba music with your bucket and spade, there will be plenty to see and do throughout the day. Come and create on the themes of the sea and music. All ages. Bilingual. £3 pay for child only Movement sessions for babies and their adults exploring all of their senses. Up to walking age. Bilingual. Bring your own bucket and spade and get ready to make some music with Codi’r To. All ages. Bilingual. Poetry Workshop With Casia Wiliam, Welsh Children’s Poet Laureate Caban 10am (Welsh), 11.30am (English) School Years 3 and 4 1.30pm (Welsh), 3pm (English) School Years 5 and 6 £3 Join us for a lively session of playing with words and writing poems about the sea on World Oceans Day. PL2, Level 2 11.45am (Welsh), 12.45pm (English) Decorate your own seathemed biscuits with Cegin staff and enjoy them whilst listening to tales from the sea with Mared Elliw Huws. All ages. Baby Brahms Concert Level 0, Pontio 12.45pm Half an hour of live classical music for babies and their families. Babies are free to feed, crawl and dance to the music! 0-36 months. Bilingual. 2pm Check out our June cinema programme for details of the film choice. In addition to the workshops, BLAS works in the community and with schools. An insight into our latest work balletLORENT Rumpelstiltskin balletLORENT dance company came back to Pontio with their production Rumpelstiltskin. Following the same format of their show Snow White in 2017, the company auditioned local children to be part of the production. There were four workshops, two at Ysgol Glancegin, one at Ysgol Glanadda and Coed Mawr and one open audition. The young cast from Snow White was invited to a ‘reunion workshop’, and from this workshop one child was chosen to play the Young Rumpelstiltskin and one to play Young Shepherd’s Daughter. In addition to the young cast, there was also an open audition for the older generation and five very special ladies were chosen to be part of the show. Our Voices Mared Huws, Arts Development Co-ordinator at Pontio, presented certificates at Ysgol Friars to the young people that took part in the Our Voices project. This was a celebration of a very successful crossgenerational project. Me, You and Lies The two older BLAS classes, Years 7, 8 and 9 and Year 10 - 13 joined forces to devise an original show, a farcical comedy following the misadventures of the opening night of the Lies Spell Murder play at Green Gable Manor by S.A.L Youth Theatre Company. During the chaos of last-minute rehearsals, everyone’s secret was revealed. Première of the Documentary ‘Exploring Girls’ Confidence’ An Arts Research Project with Ysgol Llandygai. The children, staff and parents of Ysgol Llandygai came to Pontio Cinema to watch the first screening of the documentary film ‘Exploring Girls’ Confidence.’ This was the culmination of a 10 week arts residency at Ysgol Llandygai. Take-Over Day Kids in Museums balletLORENT’s young cast took possession of Pontio as part of the technical rehearsal for their production by dancing on the Theatr Bryn Terfel stage and learning about lighting and backstage. Careers Wales BLAS, along with the Pontio marketing team, having been working with Careers Wales to encourage young people to think of the arts as a viable career prospect. 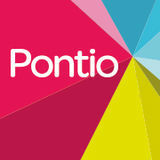 This year, Pontio won the Silver award from Careers Wales for our engagement work. Ballet Cymru Workshop BLAS supported Ballet Cymru in holding a ballet workshop at Ysgol Glanadda and Coed Mawr and with Linzi Grace Dance School. BLAS also held numerous workshops in schools and at Pontio as part of its outreach programme. Saturday, 22 June 2-6pm Synthesis is a fund to encourage scientists and artists working in the performing arts to develop ideas together which bridge different worlds. Following the success of the initial pilot project in 2016, proposals were again invited earlier this year and this will be an opportunity to share the two selected arts/ science collaborationsâ&#x20AC;&#x2122; work in progress. Studio FREE A bird festival focused on the science of flight including multiple interactive stations, participatory performance and professional dance showcase. Aiming to engage everyone with the sciences of bird flight â&#x20AC;&#x201C; locomotion, structural anatomy, aerodynamics and flocking patterns through a puppetry and dance performance suitable for young participants and audiences of all ages. Gain an insight into the collaborative process at the heart of Synthesis by visiting the exhibition in the glass case and screen on Level 0. Sing for Sanctuary / Canu am Noddfa ÂŁ15 ÂŁ10 concessions Bangor Community Choir and North Wales Rugby Choir join other choirs from the area in support of two local charities working with refugees. Each choir will entertain you with their own selection of songs before coming together in a joyous finale. the playwrights, cast and directors. For details regarding the rest of the tour, and further information about the plays, including information about the cast and directors, please visit theatr.cymru This is a Welsh-language presentation. The New Playwrights’ Group is a Theatr Genedlaethol Cymru initiative in association with S4C, Literature Wales, Pontio, Theatr Clwyd, Aberystwyth Arts Centre, Carmarthenshire Theatres, Wales Millennium Centre and the Sherman Theatre. Pay what you decide The readings for Theatr Gen Creu ar Daith: Pwy ’Sgrifennodd Honna? will work on a Pay What You Decide basis, which means you don’t have to pay until you have seen the performance. Tickets will need to be booked in advance as usual, but there is no obligation for you to pay until after you have seen the show. You can then decide on a price which you think is suitable, based on your experience. empowerment and expanding horizons. The show’s instantly recognisable songs are filled with humor, wit and sass – leaving cast members and audiences alike seeing pink! Cwmwl Tystion/ Witness £14/£12 Early bird ticket available £12/£10 before 31st May Tomos Williams trumpet Huw Warren piano Rhodri Davies harp, electronics Francesca Simmons violin, saw Huw V Williams bass Mark O’Connor drums Simon Proffitt live visuals Cwmwl Tystion / Witness Trumpeter Tomos Williams has assembled a cast of brilliant Welsh musicians to perform a new work which reflects on the extraordinary times that we live in. O’Connor, Huw V Williams and Francesca Simmons all bring unique contributions to the project. Simon Proffitt will also be accompanying the performances with live visuals, interacting with the music in real time. ‘The Cwmwl Tystion Suite’ has been funded by Tŷ Cerdd, and the tour is made possible by generous Arts Council of Wales financial support. Sistema Cymru Codi’r To! £5/£2 Inspired by the hugely successful and famous El Sistema programme from Venezuela, Sistema Cymru - Codi’r To is a community project which works with local primary schools and their communities to deliver regular musical tuition, working with whole year groups of children. Join us to celebrate our 5th Birthday with pupils from Nursery, Reception, Year 1, 2 and 6 Ysgol Glancegin, Bangor as they raise the roof with their choir, brass band and lively Samba band! hangs around Pasquale’s kebab van after their long nights of boozing. Pasquale’s quest to find a wife and produce a son and heir to his kebab empire shocks Ernesto into action, and he and Norina conspire to trick the old man, secure their future and drag him into the 21st century. Director Daisy Evans and Conductor Stephen Higgins have collaborated to give the traditional Don Pasquale tale a modern setting. Performed by 4 singers and an on-stage ensemble who also become part of the action, this is a fantastic new take on a timeless opera. Look out for the Shakespeare-themed cocktails in Bar Ffynnon and Shakespeareinfluenced menu on Level 2. THE COMEDY OF ERRORS / TWELFTH NIGHT / PERICLES £7.50 standing £10.50-18.50 seated £10.50 under 18 Shakespeare’s Globe return to Pontio and present a trio of plays exploring the themes of refuge and displacement. Taking on multiple roles across all three plays, the company will unravel these timeless tales of those who have crossed seas, lost their families, and are finding out what belonging truly means to them. What’s it like to go to the theatre and not know what you’re going to see? Take part in Shakespeare’s Globe’s democratic theatrical experiment to find out! It will be up to you to vote for which of the three plays on offer you want to see. The rules are simple: the loudest cheer wins, and the action starts straight away! Globe in Y Glôb! In the run up to the Globe’s visit to Bangor, Pontio will hold an informal and fun Shakespeare singalong in the famous Y Glôb pub in Upper Bangor. For further details, contact m.huws@bangor.ac.uk. who attend...but even better... in 5 of those bags of sweets are VIP tickets to a tour of Molly Mocha’s World of Candy! Who will win the tickets and who will the children meet along the way on their oncein-a-life-time VIP tour? Come along and watch a magical sweet treat for all the family, where you will sing, dance and live a storyline that you will remember forever by ‘Academi Westend Academy’ - bringing performing arts alive in Bangor. 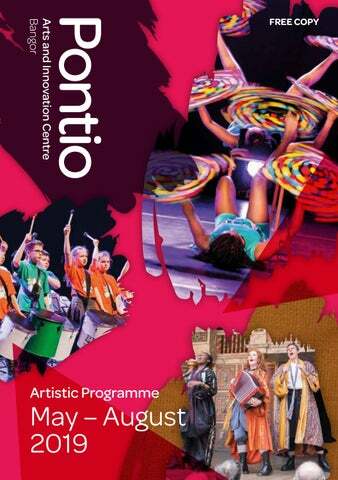 Contemporary circus has held an important place in Pontio’s artistic programme for many years. From the beautiful BIANCO by No Fit State back in 2013, which went on to tour the world, to Pirates of the Carabina’s FLOWN in 2015 and 2017’s Colombian extravaganza, ACELERE we’ve aimed to bring you the best in contemporary circus shows. This time, we welcome Circus Abyssinia from Ethiopia with their stunning circus production, Ethiopian Dreams. Expect a fun family show full of acrobatic daring and dance – a perfect way to start the summer holidays. See over the page for further details of our headline show. r, Check out our website, Twitte Facebook and Ins tag ram for regular updates on the circus feast programme… and keep the date in your diary! country without one. When the boys’ wish is granted by the Man in the Moon, they are joined on a magical journey by a host of high-flying, contorting figures - some joyful, some enchanting, others menacing and strange, but all of them circus ‘dreamers’ who together awaken an incredible new Ethiopian tradition. Circus, physical theatre, spoken word and music combine in a dark modern fairytale told in Welsh and English. Fast moving, funny and a little bit twisted, Drudwen delves into the complex motives at the heart of human relationships and how the pursuit of individual desire can generate disastrous consequences. Mr Phormula (Double Wales Beatbox Champion) and Henry Horrell, Bardd build their sound on the Harp like repeats of Martin’s Kalimba and the technical brilliance of Mr Phormula’s Human Beatbox, augmented by outstanding multiinstrumentalist Henry Horrell. The TAPE FACE Show £18 £16 students and under 18s New Jokes, New Props, Same Tape After storming into America and being seen by 51 million people online, TAPE FACE lands back on UK soil and hits the road. Coming soon An audience with Jan Morris, Twm Morys and Gwyneth Glyn Foreign correspondent, soldier, Everest climber, traveller, author of more than 40 books and all-round free spirit, Jan Morris has been one of the great chroniclers of our world, and of Wales, for well over half a century. General information Group Bookings We cater for groups and schools and can occasionally offer great discounts. Please contact our Box Office for more information on 01248 38 28 28. All bookings are subject to our standard terms and conditions. Please visit our website for more information https://www. pontio.co.uk/Online/term Postal Charges ÂŁ1 mailing charge is applied if you request tickets by post. Tickets by post can only be requested until 10 days before the event to ensure they reach you on time. After this, all pre-bought tickets can be collected from the box office or printed at home. Families Where a family ticket price is denoted, the offer is available to a group of four. A minimum of one member of the group must be under 18. Concessions Wherever concessions are denoted for Pontio events, the following categories are included in that definition, unless otherwise stated: students and those over 60. Children and young people include anyone under the age of 18. Children under 2 years of age go free. Hynt Access Scheme Art and culture is for everyone. If you have an impairment or a specific access requirement, often enjoying a visit to a theatre or an arts centre can be more complicated than just booking tickets and choosing what to wear. Hynt is a national scheme that works with theatres and arts centres across Wales to make things clear and consistent. Pontio is a part of the Hynt scheme as we believe it offers our customers the very best practice in fair ticketing policy and accessibility. Hynt is a Membership Card Hynt is a resource Hynt cardholders are entitled to a ticket free of charge for a personal assistant or carer at Pontio and all the theatres and arts centres participating in the scheme. Visit hynt.co.uk or www.hynt. cymru to find a range of information and guidance about the scheme.